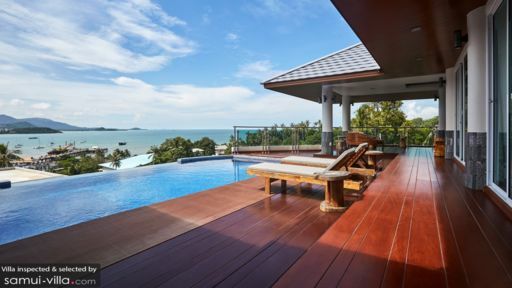 Villa Vimana is a gorgeous private property in Koh Samui overlooking expansive and sprawling beaches and dense jungles providing guests with unparalleled views and an exclusive experience. Private and walled gardens ensure the safety and seclusion of the guests, so they can enjoy their time without any interruptions. The infinity-edge pool enables the guests to make the most of the scenic beauty of the island for as long as they want. 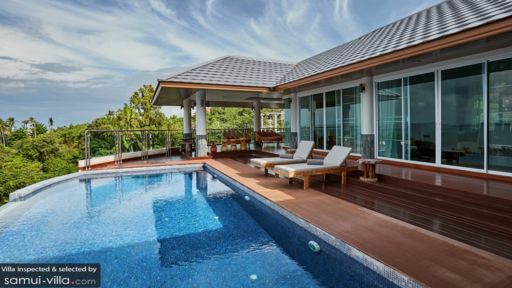 The three-storey villa is perfect for families, friends and couples traveling to Thailand for a great tropical adventure. Villa Vimana boasts five well-furnished and spacious bedrooms for its guests. Each bedroom is furnished with double beds and a flat-screen TV. There are enviable views right outside your window and door, while the rooms on the top-floor lead right out to the pool. The air-conditioned bedrooms are simple in terms of décor, and super comfortable, so much so that you wouldn’t want to leave! The en-suite bathrooms are quite large with soaking bathtubs and spacious showering areas. The beautiful scenery surrounding Villa Vimana is everything you can expect from the paradise that is Koh Samui. Sitting in the comforts of your private villa, you get to take in the raw beauty of natural elements all around you. The infinity-edge swimming pool is located on the topmost floor of the villa, for the best experience. While you enjoy a refreshing dip in the pool, you can enjoy a beautiful sunset over Bangrak bay and Pier. The pool is surrounded by a wooden sun deck which houses large, circular wooden benches that double as daybeds where you can laze around and even indulge in naps. There are two living areas at the villa, and each is well-furnished with spectacular views of the outdoors. While one is a larger, formal sitting and dining area, the other living area also holds a dining area and is meant for a more informal setting. With comfortable, and cushiony couches placed in the living rooms, guests can enjoy to the fullest while they rest. The flat-screen TV is there for your entertainment, and complete and utmost comfort is the idea behind the décor. A wooden dining table resides in the room as well, and can seat up to 6 people easily. A fully-equipped modern kitchen is accessible by the guests, and is fitted with the best appliances. The other living area is also well-furnished with comfy couches and armchairs, as well as a dining table fit for 6 people. The rooms are well-lit with natural lighting flooding in through the glass windows. The wooden panelling and modern décor add a luxurious and opulent ambience to the two rooms. 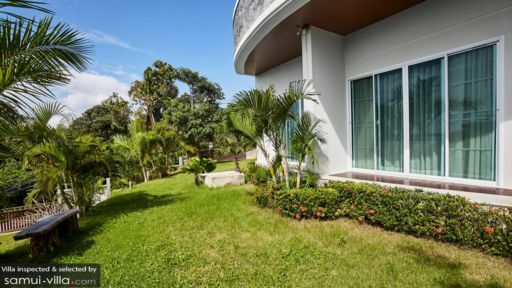 The villa offers fulltime services for its guests, as the maids reside in their private quarters and are present to take care of things for you. They can assist you with any arrangements that need to be made for travel and touring the town, and even help you with meals. Bangrak beach is only 300 metre away from the villa, so you get to enjoy the full tropical adventure with watersports and other activities. You can even pay a visit to the famous Big Buddha that is not far from the villa either. There is a supermarket in the vicinity, where you can get essentials for your stay.